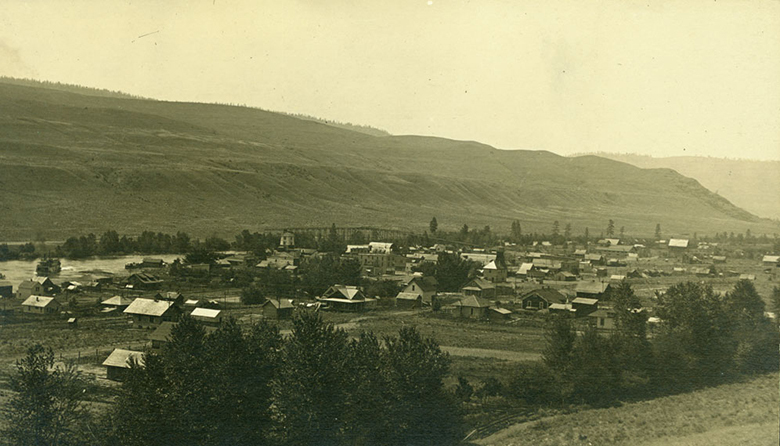 The town of Okanogan, WA around 1909. On September 30, 1907, residents of Okanogan in North Central Washington voted to incorporate the town. The vote was 74 to 1. Settled in 1888 as Alma, the town was renamed Pogue in 1905 in honor of a prominent citizen. But when it came time to incorporate, the name Okanogan was chosen due to the community's location on the Okanogan River -- as well as in Okanogan County -- and its proximity to the fledgling Okanogan Irrigation Project. The site of Okanogan, a prime fishing spot, was used for thousands of years by the Southern Okanogan Tribe, also known as the Sinkaietk or Uknaqinx, as well as by several other tribes of the mid-Columbia. Non-Indian settlers arrived in the region in 1860, but it wasn't until 1888 that the Okanogan County seat was established. That honor first went to the mining town of Ruby City, but voters were so disgusted that a town of "whores, thieves, and drunkards" should represent the county's interests that the seat was soon moved to Conconully. Conconully was hit hard by the Panic of 1893, and it got wiped out by a flood the following year. In 1914, the Great Northern Railway arrived and Okanogan -- which had also received some prominence thanks to Japanese American photographer Frank Matsura -- succeeded in a spirited campaign to wrest the county seat from Conconully. Much of Okanogan's success comes from apple growing, and the town weathered the Great Depression better than most due to the abundant crops grown nearby. The construction of Grand Coulee Dam in the 1930s also brought much-needed work to the region, and upon its completion supplied more water for irrigation and produced cheap electricity for pumping that water. Today, apples are still an important part of Okanogan's economy, but so is tourism, especially for people who want to experience the town's history. Fifty years ago this week, on September 29, 1968, a "rough draft" of the North Cascades Highway was dedicated at Rainy Pass. Much work was still needed on the cross-mountain stretch, but more than a thousand intrepid travelers gathered from both sides of the range to take part in the celebration. Some came in trucks and jeeps, others arrived by dune buggy or motorcycle and a few even came on horseback over the unfinished road. Senator Warren Magnuson was there, having arrived late by helicopter, wearing a crisp blue suit. Governor Dan Evans showed up a few minutes later in a highway department vehicle, casually dressed in a big comfy sweater. Less than a week after the dedication, on October 2, 1968, President Johnson signed a bill creating North Cascades National Park, which had been advocated for years by the North Cascades Conservation Council. The North Cascades Highway officially opened in September 1972, providing a new transportation corridor across the mountain range as an alternative route to the one through Stevens Pass to the south. That area of the mountains also celebrates an anniversary this week, of the October 2, 1993, opening of the Iron Goat Trail -- a project that was accomplished thanks to the efforts of volunteers like Ruth Ittner. The Donation Land Claim Act took effect on September 27, 1850, luring many settlers to the Northwest. Exactly one year later, scouts from the Denny Party, who had just arrived at the mouth of the Duwamish River, met up with the Collins Party, which had already been there for a couple weeks. The next day, scouts David Denny and Lee Terry made claims out at Alki Point, while John Low returned to Portland to fetch the rest of the party. On October 1, 1912, the Gonzaga School of Law opened in Spokane. Vancouver Junior College opened on October 2, 1933, and Lower Columbia Junior College opened a year later on October 2, 1934. The University of Washington opened its medical school on October 2, 1946. On October 1, 1990, UW opened branch campuses in Bothell and Tacoma, and UW Tacoma opened a permanent location in the downtown warehouse district on September 27, 1997. On September 28, 1924, more than 40,000 people gathered at Seattle's Sand Point Airfield to welcome two U.S. Army aircraft that had just completed the first aerial circumnavigation of the globe. The two planes were the survivors of a fleet of four Douglas Air Cruisers that had departed Sand Point for the round-the-world trip more than five months earlier.